BenQ, a leading manufacturer of digital lifestyle devices, today unveiled a new additions to its digital camera lineup, the BenQ DC E521 digital still camera. The BenQ E521 features a 5 Megapixel CCD (charge-coupled device) image sensor, 3X optical zoom, MPEG-4 movie format and 2.0 inch OLED advanced display screen for very sharp rendering of photos. Targeting technology "first adopters" who demand the most advanced solutions, the BenQ DC E521 digital camera features Pentax's Super-Multi Coating (SMC) lens, a 3X optical zoom and fluid VGA movie recording at 30fps with AVI (MPEG-4) format. 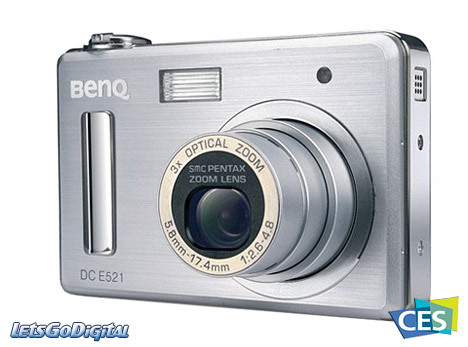 The new BenQ digital camera is presented at the Consumer Electronic Show (CES) in Las Vegas. BenQ E521 camera - 5 Megapixel - The new BenQ E521 digital camera offers an ultra-slim, compact design and versatile feature set, and are ideal for consumers seeking a high-quality multi-function digital camera at an affordable price. Futhermore the BenQ DC E521 features a high quality Organic Light-Emitting Diode (OLED) display of 2-inch format. The camera comes with 20MB internal memory and supports Secure Digital flash memory to expand its storage capacity. 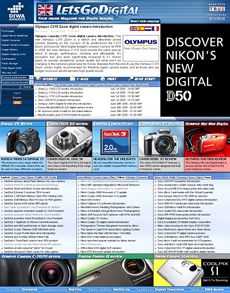 The E521 digital camera will get a price tag of EUR299 and will be available in January 2006. - Available in January 2006.